Gideon turned two years old this week, and his party is today. 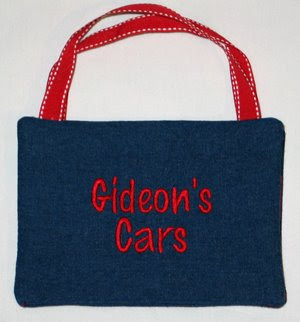 He is really into cars and trucks, so I decided to make him a car carrier. 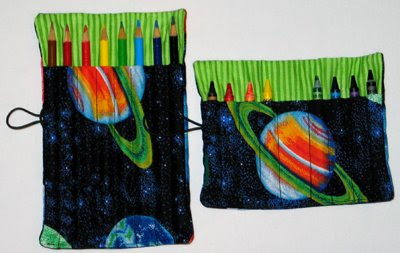 I was inspired by Sewing For Sarah's design; I modified her crayon roll design to accomplish the same goal. 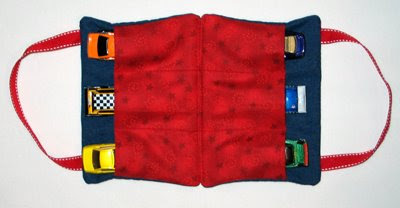 The carrier holds six cars. This was modeled with Annaliese's cars. We went shopping to get Gideon a couple Hot Wheels. I think it took Annaliese just about as long to pick those out as it did for me to make the carrier. :) She had a vision for what Gideon wanted. 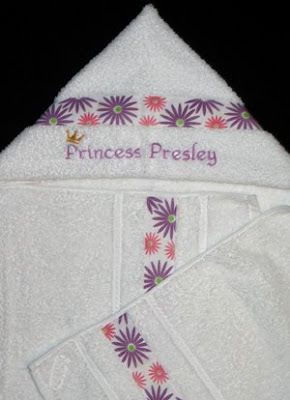 Barbara's special little relative Presley is turning four, and she ordered a few items to give her at her birthday party today. Both Barbara and Presley came over a while back to pick out what they wanted, so Presley got to tell me her preferred colors and fabrics. 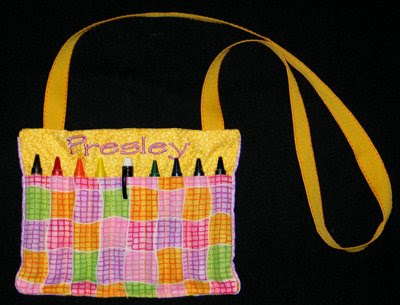 First we have a personalized crayon purse. 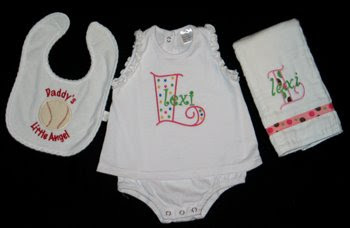 The design is from Sewing For Sarah, and I added her name with Tinker Toy font from Sew Crazie Designs. 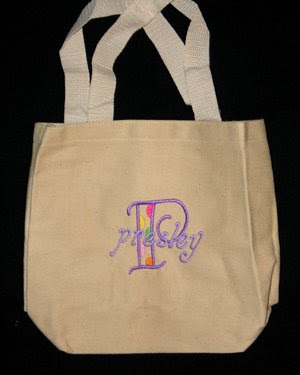 Next I monogrammed a tote bag, using Five Star Font's Whismy Dots. 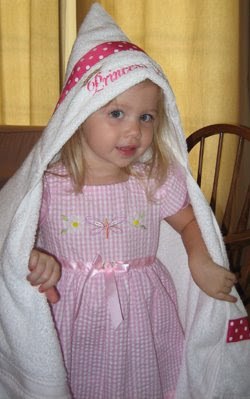 And finally I made a hooded towel for her. I used Embird Alphabet #33 to add the text. 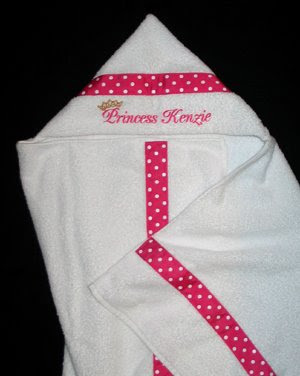 Kenzie turned three this weekend, so Annaliese and I decided she should get a hooded towel for her party, especially since it was a princess-themed party. I got to see her new swimsuit, so I picked the shocking pink ribbon to match it. I used Embird Alphabet #38 for the text. 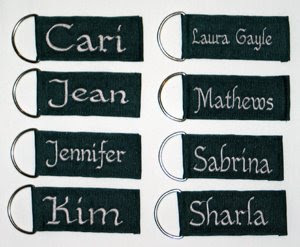 Sabrina requested key chains to give as gifts to the parents who volunteered in her classroom this year. To stick with the school colors, I used a dark green ribbon and gray/silver thread. I used Embird Alphabet #33 on all of them. Hannah is a HS senior at our church who will be graduating soon. She has a special place in my heart because Annaliese adores her and Hannah makes a special effort to talk to Annaliese every time we are at church. She has taught her Bible class and also often babysat for our life group. So I wanted to do a little something special for her. 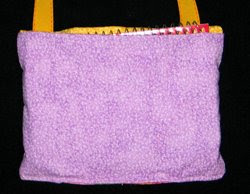 I made this tote bag, and included a permanent fabric pen for her to collect signatures if she wants to. 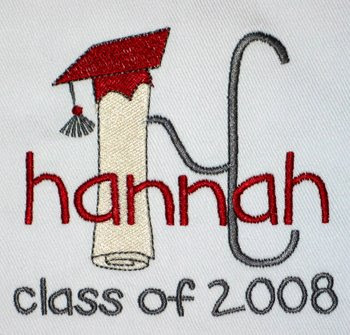 The monogram is Five Star Font's Diploma~Graduation Monogram. 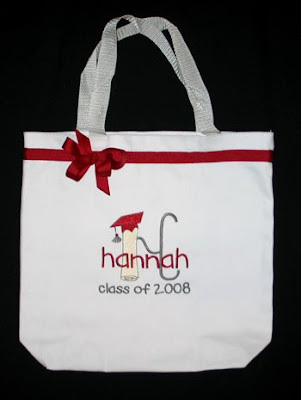 I stitched it on a white tote bag using her school colors and added ribbon and a bow! 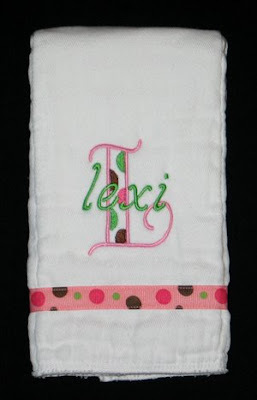 Tammy requested that I monogram a set of receiving blankets she purchased off of her sister's baby registry. For one she wanted a phrase using their last name, and for the rest just a "W". For 'I'm a "Whalen" Baby' (hee hee) and the white W I used Embird Alphabet #8, for the other two W's I used Embird Alphabet #17. After dinner we told her our big news, and she got very excited about a baby joining our family. While morning sickness has already set it, God blessed me with an hour of feeling good that evening so I could get her shirt stitched. 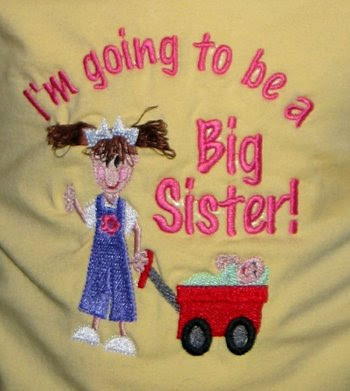 She wore it to Life Group Friday night, as well as preschool Monday morning, to announce our news. The design came from Nobbie Neez Kids. Since I wanted to add "I'm going to be a" to "Big Sister" and I couldn't match the font, I switched it out and used Embird Alphabet #8. This is a fringe design so the hair is hanging loose on purpose. Speaking of orders, I'm feeling very nauseous and exhausted. I'm going to do my best to complete the orders that I have already committed to, but I may not accept new ones over the next few weeks. Feel free to contact me, just know you may get a "no" or a "not right now" as an answer. Pray this stage passes quickly so I can return to being a good mommy and sewing! We found out two weeks ago, and yes, this baby is planned. I haven't seen an OB yet to get an official due date, but based on my calculations we are expecting him/her to arrive between Dec 28 and Jan 4. So we are praying for a 2008 tax deduction! At this moment Annaliese wants a brother, but initially she said she wanted a sister... hopefully she'll be happy with whatever we get! 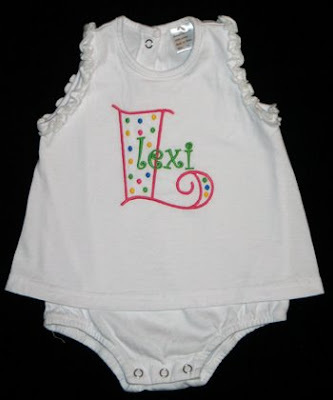 The romper design is from the Dot Alphabet available at Julia's Needle Design. I added her name with Embird Alphabet #17. The romper is from Dharma Trading. And finally the applique baseball on the bib came from a baseball sucker holder design from Embroidery Garden (a freebie on her yahoo group) and I added the text with Embird Alphabet #8. 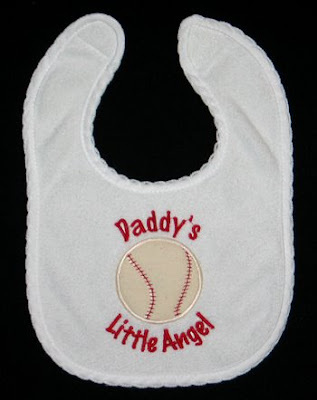 Lexi will be born in CA, and her daddy is a big Angels fan. 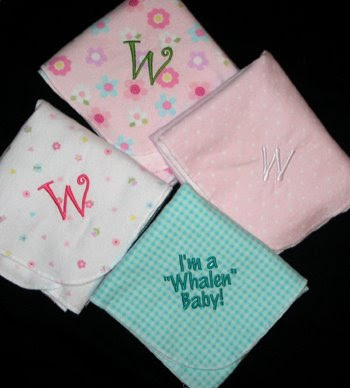 The other shower is for a friend expecting a little boy, so Carla ordered this burp cloth. 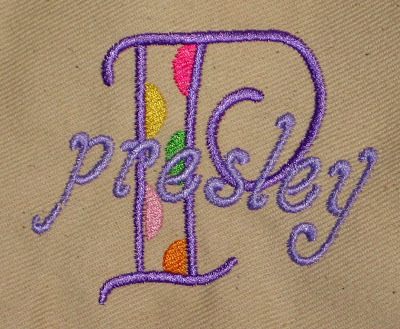 This design came from Hennessy Embroidery and the text was added with Embird Alphabet #2. Annaliese's buddy Bryce turns four tomorrow. His superhero party is this afternoon. I searched locally for superhero fabric, but would you believe I couldn't find any Superman, Batman or Spider-man fabric?? 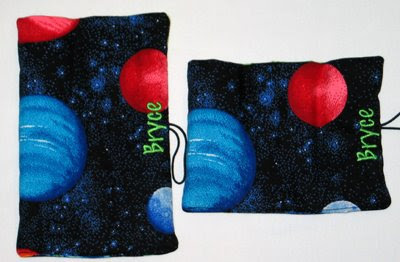 Oh well, I settled for this space fabric to make him a set of crayon and pencil rolls (designs from Sewing for Sarah). I personalized these in yet another way. I've been pleased with Annaliese's set where I used ponytail holders as the closure. So I opted to do that for Bryce as well. 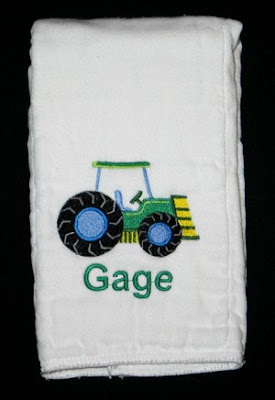 Before making the rolls I embroidered his name on the back fabric (used Embird Alphabet #8) so that it would be visible when they are rolled up.